“Jesus was made known to them in the breaking of the bread.” This is still true to this day in the Mass. 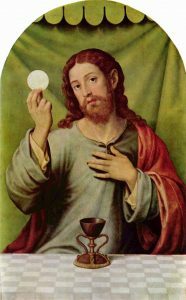 If we want to truly know Jesus, keeping his commandments so we are not liars as the Second Reading tells us—the sacramental life, but especially the Eucharist, is essential. Through the Eucharist, we can encounter Christ just as the disciples who touched Him did. We know that we aren’t required to attend daily mass—however, there is nothing else we can do that is so powerful and so meaningful. The mass itself has changed the world, and continues to do so. We must allow it to continue to change us! ng Him for these great gifts. If there is a day during the week that you don’t regularly attend mass, make an effort to do so this week if possible! If you are already a daily communicant, invite someone who doesn’t regularly attend daily mass to do so. Sunday, the day of rest is here! Tonight try and go to bed at a time so you can get 7 hours of sleep.